Ever since the Apple Watch was introduced, I’ve criticised Apple’s wearable device. My habit was to contrast the Apple Watch with “real” watches. But after buying and wearing an Apple Watch Series 3 for months, I’ve completely changed my mind. I’ve been a relatively steadfast critic of the Apple Watch. Ever since the Cupertino giant introduced its first wearable gadget, my reaction had generally been a reliable “Why?” You can consider my scepticism here. Or here. Or here. 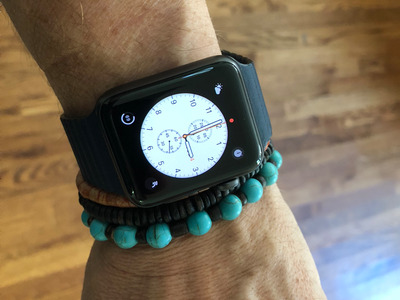 Admittedly, I didn’t entirely dislike the idea of the Apple Watch as a timepiece – I actually pledged to buy a first-generation version, in stainless with a steel bracelet, once the prices dropped. And in the grand scheme of things, I was more excited about the Apple Watch, pre-launch, than any other device in the company’s history. When the Watch landed, however, I wasn’t thrilled, and I mounted something of an Apple Watch resistance. But then I experienced a moment of what one might call weakness. My iPhone conked out on me right before I had to head off to Detroit and California in succession to attend the Detroit Auto Show and undertake some Tesla coverage, respectively. The phone was under warranty, so I went to my friendly neighbourhood Verizon store and obtained a new one – and gave into the salesperson’s convincing pitch to add an Apple Watch Series 3 to my plan. “What the heck?” I figured. I like watches, and the serious watch world has been passing judgment on the Apple Watch since day one. The LTE version of the Apple Watch Series 3 also benefits from true wireless capability, meaning that you can leave your iPhone at home. I was curious, but I also felt that the Verizon salesperson was, well, an excellent salesperson. Plus, I’ve been with Verizon for almost two decades. Sometimes, if you’re that deep in a relationship, you go with the flow. Matthew DeBord/BIMy Apple Watch Series 3. I’ve owned the Apple Watch Series 3 for roughly nine months at this point, and although I haven’t really even scratched the surface of its many capabilities (I just discovered nightstand mode, which lets you use your watch like a bedside clock, a few weeks ago), I’m ready to admit that everything I formerly thought about the device was wrong. For starters, the watch has three key factors in its favour. 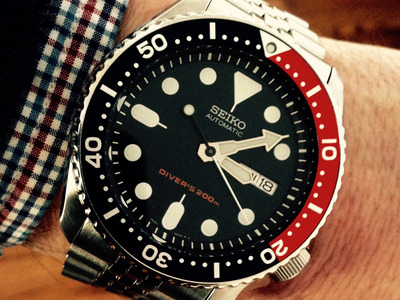 First, it’s an excellent and versatile watch, a worthy addition to any collection. Second, it’s quite robust. Third, it’s among the most comfortable watches I’ve ever worn, and I’m very big on watches being comfortable to wear (in my previous criticism of the watch, I’ve said it wasn’t comfy to wear, but I hadn’t worn it for very long, and as a result I was very much mistaken). I have the 42 millimetre version in Space Grey, distinguished as an Apple Watch Series 3 with LTE by its red crown. I prefer the watch in Space Grey versus stainless steel, because it makes the piece wear a bit more discreetly, and gives it a high-tech, sporty-yet-serious vibe that transfers nicely from workouts to wearing with professional clothing. I don’t like to have a lot of watches in rotation, and my modest collection supports that. At the moment, I have three automatics and two quartz pieces, with one of the quartz watches mainly serving weekend duty. 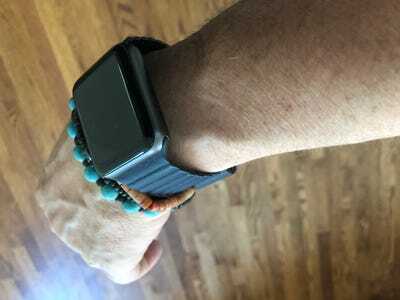 For the first few months, I didn’t really get the Apple Watch and wore it infrequently. But then I figured I should submit it to a proper test, so I basically forced myself to wear it almost every day. The rest of my collection immediately suffered, and it got worse when I bought a second strap. The Apple Watch comes with a fluoroelastomer band – a type of synthetic rubber – and it’s extremely well-executed, sturdy, and comfy. I got sort of bored with it, however, and started looking for a number two. 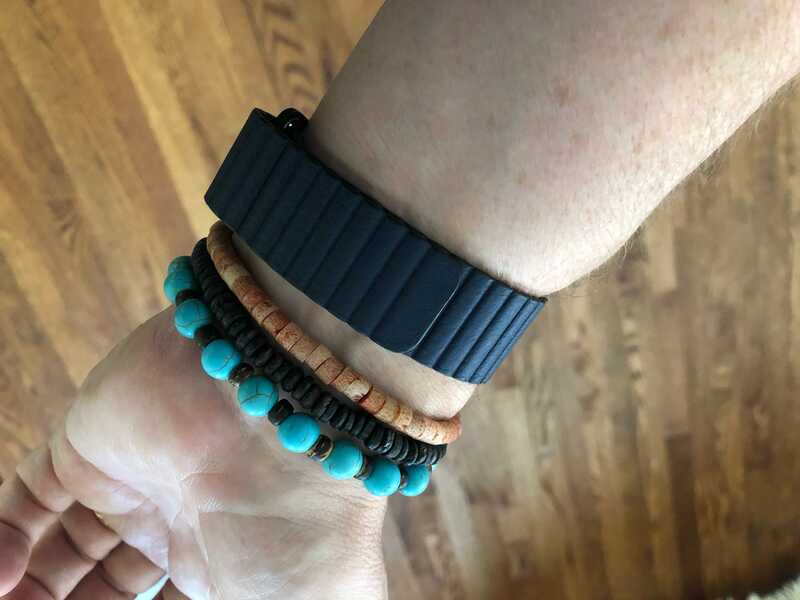 After sifting through the wide, wide world of aftermarket bands and straps, I decided to stick with the mothership and bought a Midnight Blue leather loop. Matthew DeBord/BIThe Leather Loop band. At $US149, this is a pricey strap. It’s also one of the nicest leather straps I’ve ever enjoyed; it put the Apple Watch right over the top for me. For the record, changing straps on the Apple Watch is bliss. With most watches, you need to use a special tool to swap straps (or do your best with a pocketknife), which can be a fiddly operation. On top of that, I don’t really like to switch straps, unlike many watch lovers. But on the Apple Watch, two small buttons on the underside of the watch enable you to swap straps in seconds. The leather loop is also rather innovative in its design: thin, high-grade leather is combined with an embedded magnetic-closure system to deliver an impressively precise fit. The upshot is a really good-looking package. 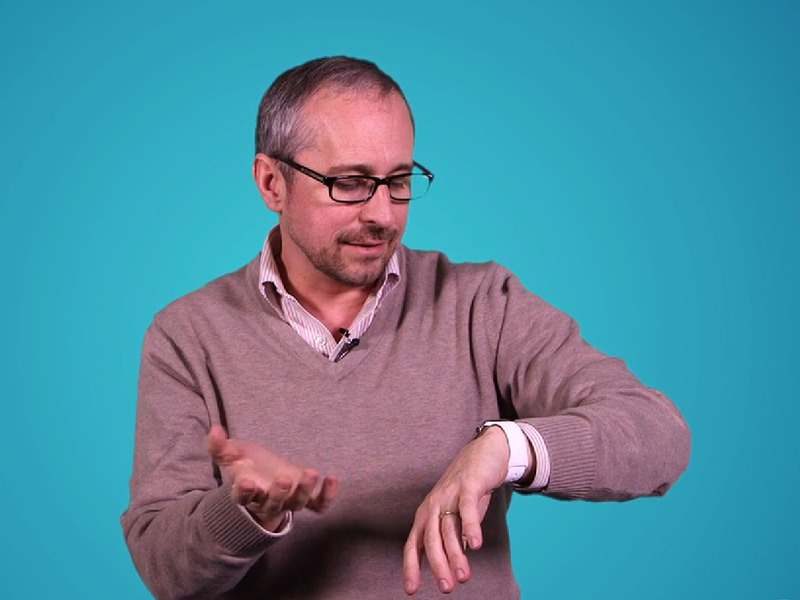 So good-looking, in fact, that the Apple Watch can induce a sort of crisis. Once I started wearing it regularly, it created the infamous “one watch” scenario. Some watch aficionados, despite having amassed big collections, often wonder whether they could simply wear one watch and call it a day. Others argue that you need two, a sport watch/everyday wearer, and a dress watch. I know a few one-watch people, and they tend to have chosen well: Rolex Submariners or GMT Masters, Panerai Luminors, Cartier Tanks. Other folks haven’t spent as much coin but have still happily donned TAG Heuers on a daily basis. These are lifetime pieces and they can go anywhere, but essentially, they do one thing and do it well: tell time. The Apple Watch obviously goes miles and miles beyond simply telling time. It also does this while offering fantastic build quality – my $US399 Space Grey model has an aluminium case, ceramic back, and something called Ion-X glass on the face – and a substantial wrist presence. Matthew DeBord/BIThe Apple Watch Series 3 wears a bit large, but it’s very comfortable. There is a learning curve, and I’m still on it. But I have gotten pretty skilled at changing the watch’s faces (Mickey Mouse in black-and-white, the chronograph, and the Utility, Explorer, and Kaleidoscope faces get the most use), giving me the option of thinking about the Apple Watch as half a dozen or more distinct timepieces. Personally, I’d like to have a roman-numeral face that makes use of the the watch’s squareness for a sort of Cartier Santos vibe, but I’ll leave that one to Apple’s designers to think about (if you’re willing to pay a premium for the Hermès edition of the watch, you can get an exclusive roman-numeral face). The fitness tracker is superb. I switched to a standing desk at my home office, and I delight in the fact that I hit my Apple-watch measured standing goal every day. Exercise and movement are also tracked, using a complete-the-wheel, close-the-circle, highly motivating, multicolored design. If you hit your mark during the day, the Apple Watch will alert you. I haven’t tried swimming yet with the watch, but in this third configuration, it’s supposed to be able to handle that tricky activity using a nifty water ejection feature. My go-to pool watch is my Seiko Diver SKX009, a dedicated dive watch that’s designed to function underwater and live to tell the tale. Apple’s assurances aside, the notion of an electric gadget without gaskets and a screw-down crown being subjected to the natural enemy of Apple devices strikes me as risky. I also wouldn’t take it into salt water, and I’d avoid the steam and heat of a shower. If I give the Series 3 a test, I should probably do it while it’s under warranty. Beyond faces and fitness, I’ve used the watch to query Siri about the weather, buy stuff at Starbucks, and make calls. The flashlight feature has also gotten a lot of use. And yes, I’ve frequently left my iPhone at home and gone watch-only, a liberating experience that vastly reduces the amount of time I spend pointlessly staring at an iPhone screen. That’s all thanks to the Watch 3’s cellular connection. Throw in some Bluetooth earbuds and you can go smartphone-free. In terms of battery life, a full charge gets me through about a day and a half. Matthew DeBord/BIThe Montblanc Heritage Chronométrie Automatic is a nice watch — but it doesn’t do that much. As for toughness … it’s hard to tell at this point, but I’ve played a decent amount of tennis while wearing the Apple Watch, and the jarring aspects of that sport haven’t had any apparent negative effects. Obviously, apart from some cool design touches – such as calling micro-apps “complications” and using a sweeping second hand for its faces – the Apple Watch is utterly unlike a potentially fragile mechanical timepiece. You wouldn’t expect it to be wimpier than a Timex Ironman (although I haven’t dropped it yet, so the jury is still out on the durability of the glass face). The Apple Watch Series 4 has just arrived, adding a goodly measure of new features to the device, as well as slightly revamped design. Some early evaluations from reliable watch outlets, such as Hodinkee, have been quite positive. So if you want to take the plunge on the latest iteration, it’s your call. I’m content with the Series 3 and haven’t even scratched the surface of its capabilities. 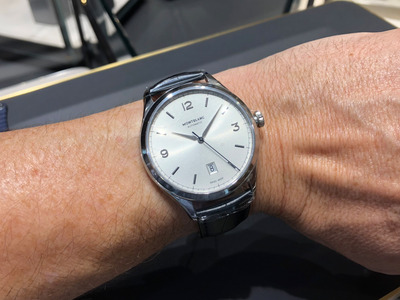 Four upgrades equals a $US1,600 layout, and for just about $US600, you could obtain the Montblanc Heritage Chronométrie pictured above – a rather lovely and affordable Swiss automatic watch that, with proper care, would give you decades (if not a lifetime) of service. Two decades of Apple Watches and you could have a Rolex. I figured I didn’t have to worry about this, back when I didn’t care for the Apple Watch. Now that I do, it’s an issue. I haven’t made up my mind yet, but it should be clear that everything I thought about the Apple Watch before I was enlightened was, to be completely honest, totally wrong. I take it all back.